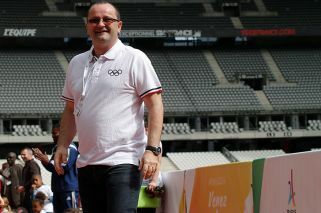 Patrick Baumann "unexpectedly succumbed to a heart attack" in Buenos Aires, as Argentina hosts the Youth Olympic Games. Patrick Baumann, the secretary general of basketball's world governing body who was seen as a potential IOC president, has died in Buenos Aires after suffering a heart attack. He was 51. Baumann "unexpectedly succumbed to a heart attack" in the capital on Sunday despite getting immediate medical help, the International Basketball Federation (FIBA) said Sunday in a statement. The death comes as Argentina hosts the Youth Olympic Games. "Nobody was more dedicated to the growth of basketball than Patrick," said Silver in a statement. "He loved the game and recognised its power to transform people's lives. He was also a dear friend and colleague who I attended countless games and events with over the past 20 years." Flags will be flown at half-staff at IOC offices in Buenos Aires and its home city of Lausanne, Switzerland. The IOC said a memorial would be held in the athlete village in Buenos Aires. Baumann was key to developing the three-on-three urban version of basketball and pushing for its inclusion as an Olympic medal event.